Sunk Cost is truly one of my favorite concepts in economics. The idea that future decisions should not be made based on past sunk costs can be a life-changing idea. So, I dedicate an entire lesson and mini project to it. And students love it! 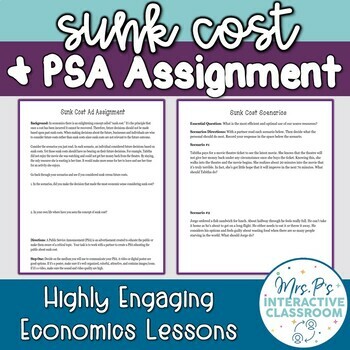 To begin, students read 6 scenarios that demonstrate the concept of sunk cost (before they know what sunk cost is). They must decide what the person in the scenario should do. After all, who doesn’t love telling people what to do?! Then they learn about sunk cost and reflect on the scenarios they just solved. Finally, they complete a mini project by creating a Public Service Announcement (PSA) via video or digital poster format educating the public about sunk cost. I love seeing them apply this awesome economics concept to the real world.